Today, mathematics, biology, medicine, and statistics are closing the interdisciplinary gap in an unprecedented way and many of the important unanswered questions now emerge at the interface of these disciplines. 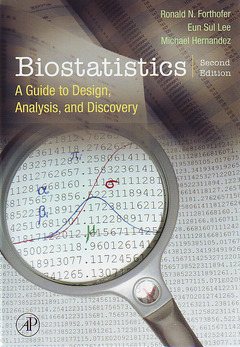 Now in its Second Edition, this user-friendly guide on biostatistics focuses on the proper use and interpretation of statistical methods. This textbook does not require extensive background in mathematics, making it user-friendly for all students in the public health sciences field. Instead of highlighting derivations of formulas, the authors provide rationales for the formulas, allowing students to grasp a better understanding of the link between biology and statistics. The material on life tables and survival analysis allows students to better understand the recent literature in the health field, particularly in the study of chronic disease treatment. Students in the health sciences, public health professionals, practitioners. Mike Hernandez has been working as a statistical analyst in the Department of Biostatistics at the MD Anderson Cancer Center for over 10 years. Working in a large medical center, he has developed an expertise in doing collaborative research spanning several disciplines from health disparities to clinical trials. He has coauthored over 40 peer-reviewed manuscripts, and is a co-author of: Biostatistics: A Guide to Design, Analysis, and Discovery 2nd ed.